This Grade II listed family tomb commemorates the Halls, a prominent local merchant family. The position of the tomb immediately to the south of the church's west door emphasises their status. Ambrose and Ann Hall were married in 1762, and lived at The Hermitage, Walton-on-the-Hill, as well as in London. 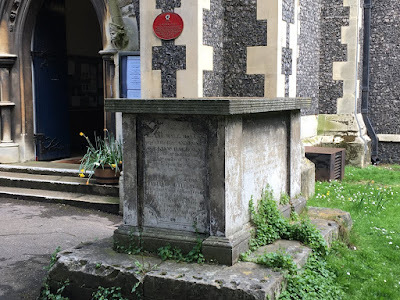 They are buried with their son, Humphrey (1763-1848) and his wife Maria Jane (née Nordaby, d 1865), and his son, Ambrose William Hall (d 1897), who was vicar of Longcross in Surrey, before moving to Debden in Essex, and his wife Anne (d 1867). The tomb is a chest tomb of simple form, with a moulded base and reeded top. The inscriptions are engraved, and original paint, used to highlight these, survives, particularly to the north and east faces. The inscriptions are set within engraved panels, and remain consistent in style, with Roman lettering, over the 85 years during which they were made. The tomb is set on a raised base, and was originally surrounded by railings; the holes for the railings remain in the base. in the […] of his Age.